eBook PDF (318 pages, 19.3 MB), ePub, Kindle, etc. Even connecting a few programs across a few sockets is plain nasty when you start to handle real life situations. Trillions? The cost would be unimaginable. Connecting computers is so difficult that software and services to do this is a multi-billion dollar business. So today we're still connecting applications using raw UDP and TCP, proprietary protocols, HTTP, Websockets. It remains painful, slow, hard to scale, and essentially centralized. To fix the world, we needed to do two things. One, to solve the general problem of "how to connect any code to any code, anywhere". Two, to wrap that up in the simplest possible building blocks that people could understand and use easily. It sounds ridiculously simple. And maybe it is. That's kind of the whole point." If you are a programmer and you aim to build large systems, in any language, then Code Connected is essential reading. 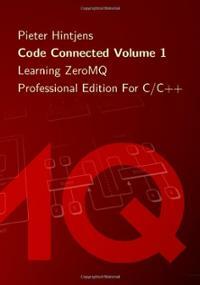 Code Connected Volume 1 takes you through learning ZeroMQ, step-by-step, with over 80 examples. You will learn the basics, the API, the different socket types and how they work, reliability, and a host of patterns you can use in your applications. This is the Professional Edition for C/C++.